This American made violin bow for sale is a good bow for the environmentally conscious player. 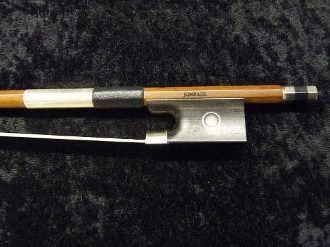 Made by JonPaul Bows in 2012, this JonPaul Ipe Violin Bow is made of the sustainable wood ipe. This ipe stick is round and strong; the camber and balance are as good as a brazilwood bow. The ebony frog fits nicely on the ipe stick. The ipe bow concept is relatively new and this bow is brand new; it has no signs of wear or damage. At $195.00, this bow would be a good choice for the aspiring violinist or the environmentalist.